Compact and portable kit provides most of the features of oxy-Aceytlene for light welding, brazing, ..
wrap around turbine flame Piezo flame On-Off trigger Anti-flare Flame adjuster..
Bernzomatic Fatboy Blue Propane479G for Map Torch..
Rothenberger P/N 3.1989 Propane Torch Handle With on/off Control Valve & Economy Trigger.. Instant On/Off piezo ignition torch complete with 1.5mt heavy duty hose. Durable stainless steel bu..
For torch down roofing, roofing repairs, road line burning & weed killing. 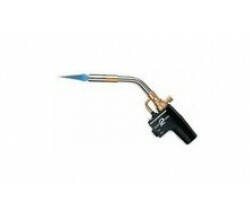 Adjustable flame intensi..
Rothenberger P/N 3.5644X Soldering & Brazing Torch with Self Ignition..
Twin stainless steel torch burners give added strength and increased max working temperature. Durab..